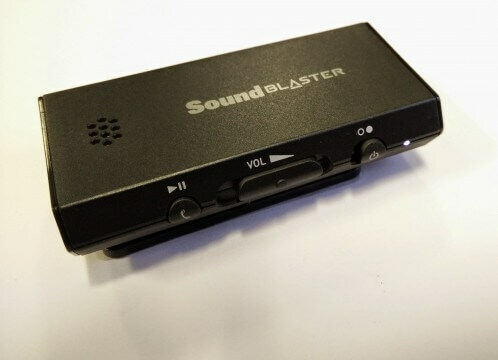 Creative products always induce a little nostalgia with me as the Creative Sound Blaster Pro was the first ever upgrade that I bought for my PC. Looking back from today and the state of digital audio, it’s hard to imagine that most PCs only went “beep” back in the late 1980s and early 90s. Once I’d installed the SB Pro, I had glorious multichannel stereo sound, and incredibly, Wing Commander II had speech. Look it up kids. 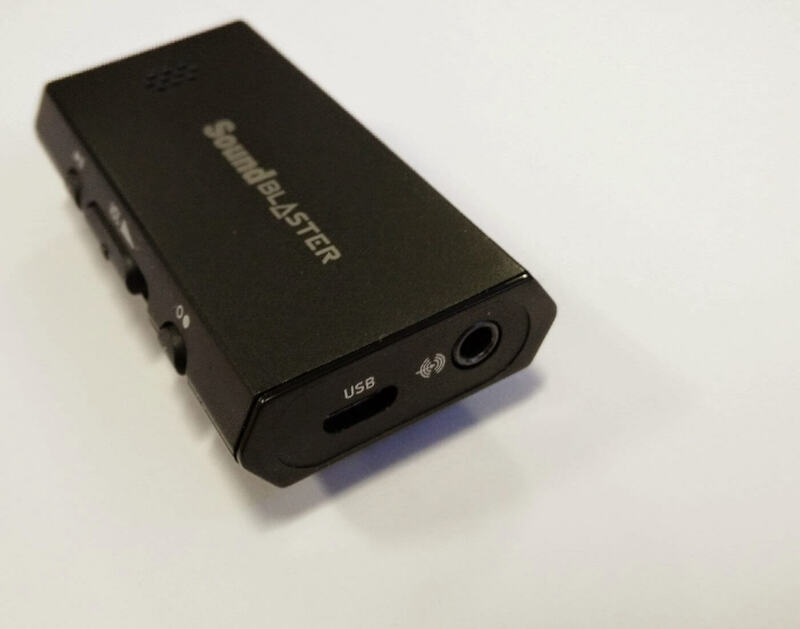 Returning to the 21st century, on review here is the Creative Sound Blaster E1 Portable Headphone Amplifier, a battery-powered amplifier supporting high impedance headphones, combined with a USB DAC sound card. 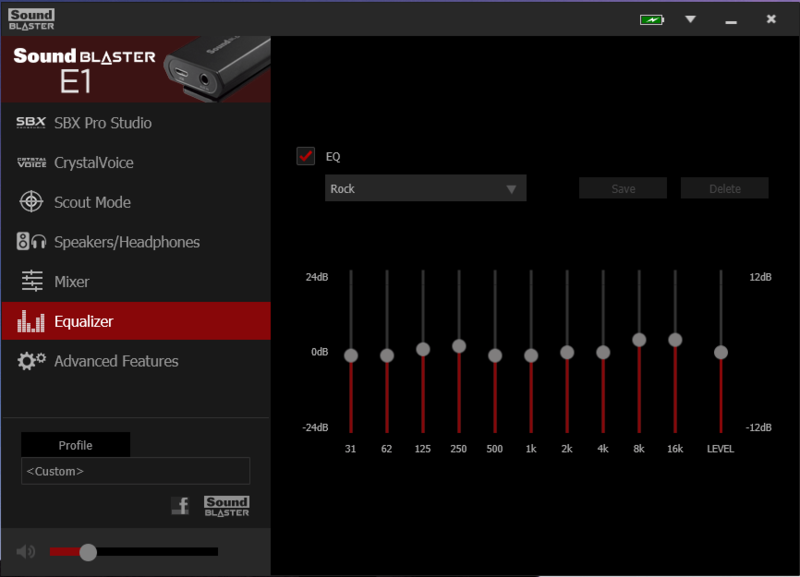 In other words the E1 lets you used studio-quality 600 ohm headphones with smartphones, tablets, laptops or desktops. Pretty much anything with a 3.5 mm socket or a USB port and it works fine with lower impedance headphones, so let’s take a look. What’s in the box? Simply, everything that you need to get going in the scenarios outlined above. There’s the E1 amplifier itself plus two bright red cables; a 4 pole (TRRS) 3.5 mm jack audio lead and a USB to micro-USB cable. The first cable is needed for tablets and smartphone listening and the second when using the E1 as a sound card (DAC). Bring your own headphones though. There’s a hint of red detailing on the E1 too but you have to look pretty hard to see it. Of course, there’s assorted instructions, warranty and disposal leaflets too. Glancing over the amplifier itself, the E1 is a lightweight plastic unit with a clothing or belt clip on the back. One end takes the music audio inputs, either digital via micro-USB or analogue through a 3.5 mm audio socket. The other end has the two 3.5 mm audio sockets, one for a set of headphones and one for a microphone or second set of ‘phones. On the side, there’s a power switch, a volume slider, a multi-function button and a small LED. 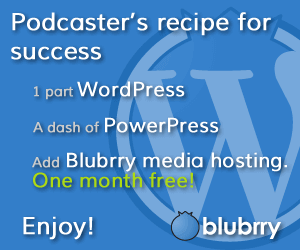 Enough of what it looks like….what does it sound like? Pretty good actually. I used the E1 in both configurations, first taking an input from a smartphone or tablet and in this instance I was using a Nexus 9 tablet and a OnePlus One smartphone, both with high bit rate mp3s and Spotify. I’m not a total audio geek, so I don’t actually have any high impedance headphones so the testing was done using Sennheiser earbuds and recent edition 414 headphones (the ones with the yellow earpads). Listening to the E1, there’s no dramatic difference from the source but it does tend to ameliorate the worst aspects of compressed digital audio, reducing the high frequency tinniness and giving it a slightly warmer feel. It particularly worked well with Spotify and other low-bit music sources, smoothing out the treble. If worn conveniently, the E1 has a built-in microphone to enable hands-free calling. Call comes in, press the multi-function button, take the call. 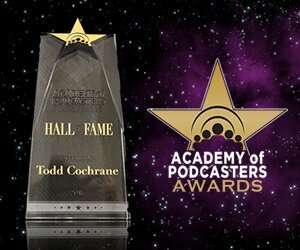 Callers reported that they could hear me well as long as the E1 was close. Clipped to my shirt was fine. 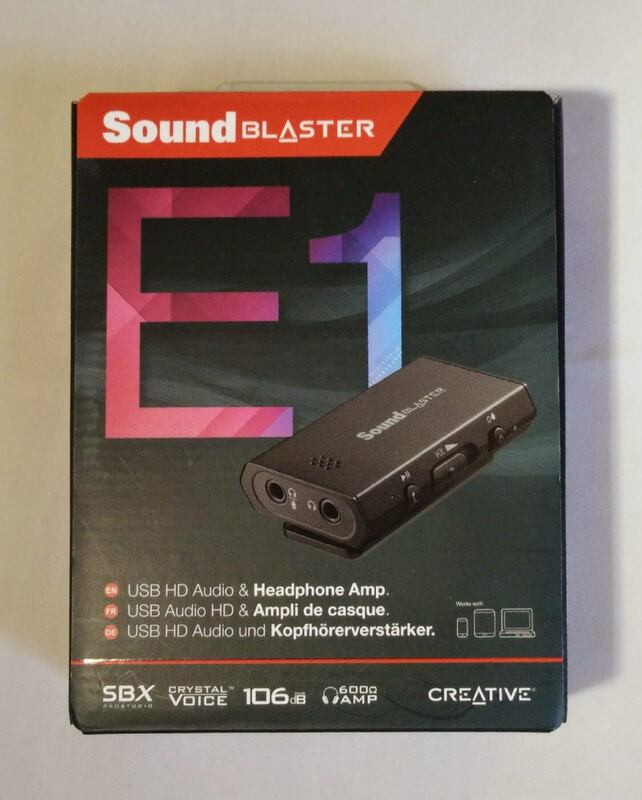 Using the E1 as a sound card is simply a case of plugging in the E1 to a spare USB port via the red cable. I tested with a Windows 8.1 Toshiba laptop, an 8.1 HP tablet via a dock and a Samsung Chromebook, and in all cases it worked out of the box. In this configuration, the presentation of the sound was good and generally superior to the audio provided by the laptop or tablet, especially when listening to Spotify. Generally, background hiss was kept to a minimum and was only noticeable in the earbuds when I went looking for it, e.g. by putting the source volume down low and increasing the volume on the E1. With the source volume at a normal level there’s no problem and is unlikely to be noticeable with on-ear headphones. In case anyone is wondering, it’s not possible to use the E1 as a mixer with two sources. Plugging in a 3.5 mm audio jack disconnects the micro-USB input. Sorry. The E1 works well out of the box, but where it delivers in spades is with the full driver and app package which is downloaded from Creative’s web site. Once installed the software gives tons of extra controls over the E1, in particular allowing the audio response to be customised. 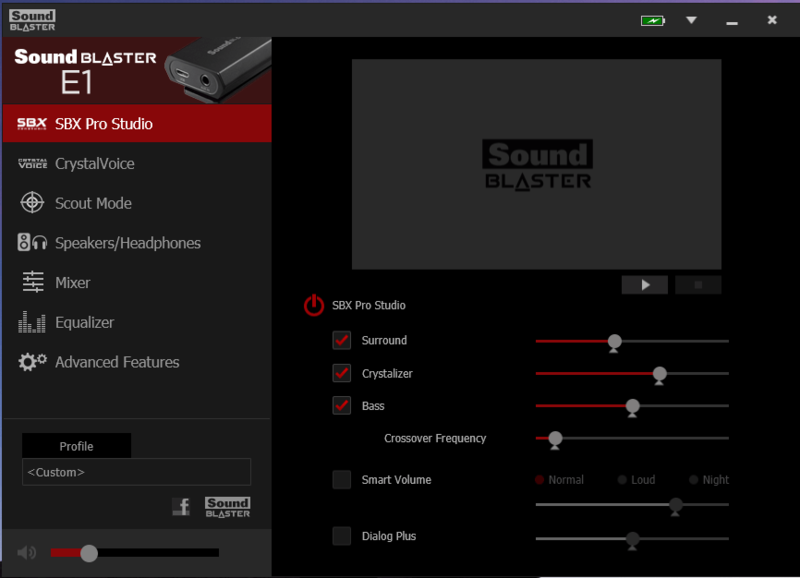 One of the best features is the equaliser which adjusts the frequency response. There are a bunch of presets with the usual suspects from classical to pop and rock, and its also customisable to personal preference. I liked this. 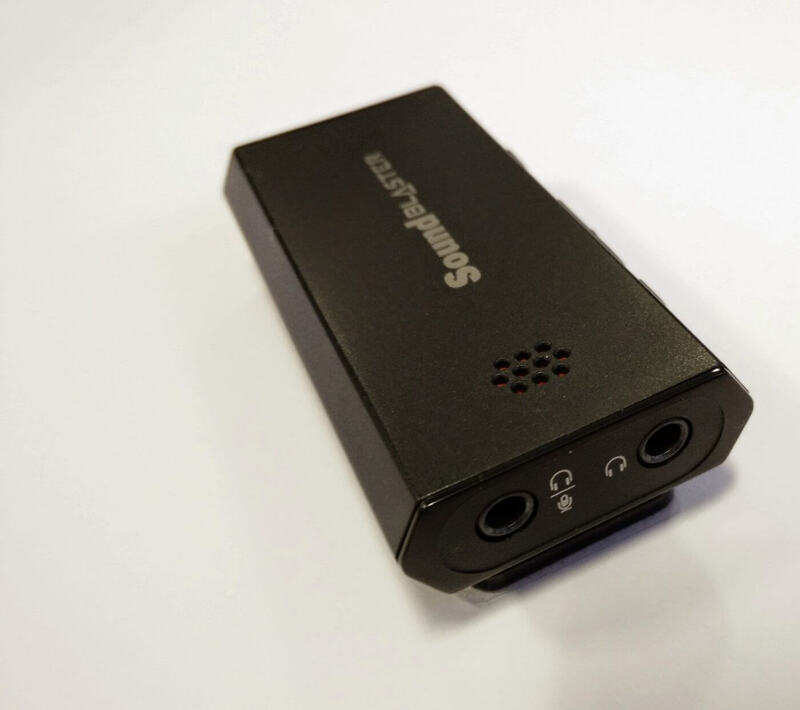 Overall, the E1 portable amplifier does what sets out to do, making compressed audio sound better, whether from an analogue 3.5 mm source or a digital USB connection. The extensive range of features from hands-free calling to audio equalisation is impressive and for those people who live in their headphones, it’s worth considering. The RRP is £39.95 in the UK or $49.99 in the USA. Thanks to Creative for the loan of the review unit.